Hi, I have one of the first photographs taken at Butlins Skegness, I was born and brought up in Cleethorpes, so going to Skeggy to Butlins for the day was nothing new and my parents and grandparents also went. The photo is of my grandparents in 1936 at Butlins in Skeggy, they weren't married yet, but my grandfathers father was Bowers and also like Billy a carnival man, my grandfathers, grandfather is said to have been friends with Billys. and this is after I have restored it and coloured it. My grandparents are the couple in the front. Welcome to the forum, Always a pleasure to see new images of Butlin's. 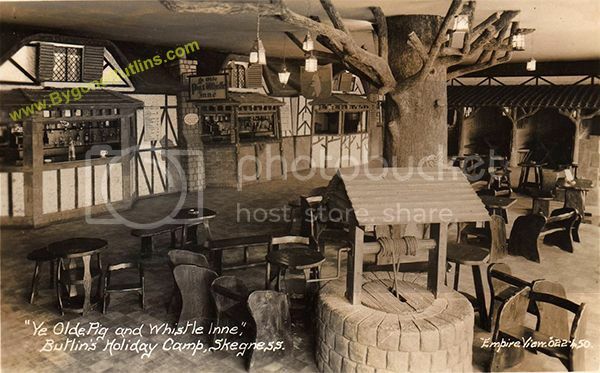 That's the old Pig and Whistle here is a postcard showing the rest of the bar.